Eldar Aliev has earned an international reputation as a dancer, choreographer and artistic director. His 13 year career as a Principal Dancer with the Kirov Ballet distinguished him not only as a technically superb classical and contemporary dancer, but also as a creative dancer whose interpretations ignited the full range of roles he performed. Dancing with the Kirov and as guest artist on many successful ballet tours including the Galaxy of Russian Ballet and the Superstars of Russian Ballet. Eldar Aliev performed in over 40 countries, dancing at some of the world’s most famous theatres, including Covent Garden, the Paris Opera, MET, the Kennedy Center, La Scala, Sydney Opera House to name but a few, his performing career also included guest star performances with the Bolshoi Ballet and The Australian Ballet. During this time, Eldar not only danced in every major role in the classical repertoire, but was also fortunate enough to work with some of the greatest contemporary choreographers, including Yuri Grigorovich, Roland Petit, Maurice Béjart, Ashley Page, etc. He was in the original cast of the first production staged in Russia of George Balanchine’s work, which took place at the Kirov Theatre (now Mariinsky). Throughout his dancing career, Eldar partnered some of the greatest ballerinas of our time, including Sylvie Guillem, Altynai Asylmuratova, Amanda McKerrow, Galina Metzentseva, Lesley Brown, Tatiana Terekhova, etc. Many of these performances were broadcasted in a variety of countries around the world and were captured on video and DVD. Eldar Aliev’s engagements include guest teaching at the Hungarian National Ballet, the Royal Swedish Ballet, The National Ballet of Canada, Ballet of Spain, the Universal Ballet of Korea, Hong Kong Ballet, The National Ballet of China, Beijing Dance Academy, Shanghai Dance Academy, Guangzhou Ballet, Guest Speaker at the Ballet Talks series at Harvard University, Visiting Artistic Advisor for Cincinnati Ballet, Ballet Master at Boston Ballet and his role as Interim Dean at the Boston Ballet Center for Dance Education. Previously, as Artistic Director of Ballet Internationale—Indianapolis, Eldar Aliev transformed Indiana’s only professional ballet company into a world-class ensemble, performing to enthusiastic audiences in Beijing, Los Angeles, New York, Taipei, Montreal and other cities around the U.S. and abroad. His commitment to the highest artistic standards and his inspiring leadership throughout his 14 years with Ballet Internationale enabled Eldar Aliev to build an artistic staff of international acclaim and recruit extraordinary dancers from around the world. Eldar Aliev’s inventive and magical version of the holiday classic, The Nutcracker, has fast become a favorite of presenters throughout the United States. Audiences have responded with standing ovations to his unique interpretation of the time-honored classic in which he deftly expanded the libretto. Eldar Aliev’s Nutcracker has also become a featured holiday show on public television. Since its debut in 2003, the number of markets presenting the festive production has grown each year and now stands at 79; this includes stations in New York, Los Angeles, Montreal, Chicago and Atlanta. Eldar Aliev’s fusion of classical and contemporary styles adds excitement and freshness to his creations. His provocative production of The Firebird gained immediate praise in both the national press and the international ballet media. His exuberant Le Corsaire gives new life to the time-honored masterwork while showcasing the dance techniques of our time. In addition to his original choreographic work, Eldar Aliev has staged an extensive list of classical ballets to the delight of both audiences and critics. 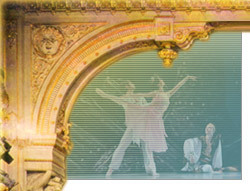 These include The Sleeping Beauty, Swan Lake, Don Quixote, Giselle, Paquita, Raymonda, Les Sylphides and La Sylphide. 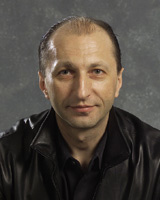 Eldar Aliev is a frequent adjudicator of international ballet competitions and has served as a jurist for two inaugural ballet competitions, the 2002 International Ballet Competition in Prague and the 2004 Seoul International Dance Competition. He returned to Seoul, South Korea in 2005 for his second consecutive year, serving as both a jurist and a member of the International Regulations Committee. In 2007, Eldar Aliev served as a jurist at the 8th Youth America Grand Prix international ballet competition in New York and in 2008 at the 23rd Varna International Ballet Competition in Bulgaria, the 5th Seoul International Dance Competition and the 2nd Beijing International Ballet Invitational. Eldar Aliev has also created a reputation as an accomplished director of international gala performances, presenting the stars of world-leading companies. You need Quicktime 7 in order to watch the videos. Click on the logo to Download.